The 212 Europa was actually a series of 212 Inter cars that had an “EU” suffix on their chassis and engine numbers. The 212 Inter was introduced in 1951 and lasted through 1952. In all, just 78 examples were made and only the last 29 of those were identified as Europas. It was sort of a stepping stone to the 250 Europa that burst on the scene in 1953. This car has wonderful style. Bodied by Ghia, it appeared on the 1952 Geneva and Turin Auto Show stands. It was one of two cars like this they built but the cars differ slightly as they were different colors and had minor trim differences. The rear fender skirts make this thing look amazing. It’s powered by a 2.6-liter V-12 making 170 horsepower. This car has a pretty amazing history. It was in the Detroit area in the 1960s and in 1972 it was found at a swap meet (it had a Corvette engine in it at that point) and traded hands for $600. Ferrari hunter Tom Shaughnessy was able to rescue it in 2011 and it was restored over a six year period thereafter by its next owner. It’s a classic Ferrari with great 1950s styling and it should bring between $1,800,000-$2,200,000. Click here for more info and here for more from this sale. 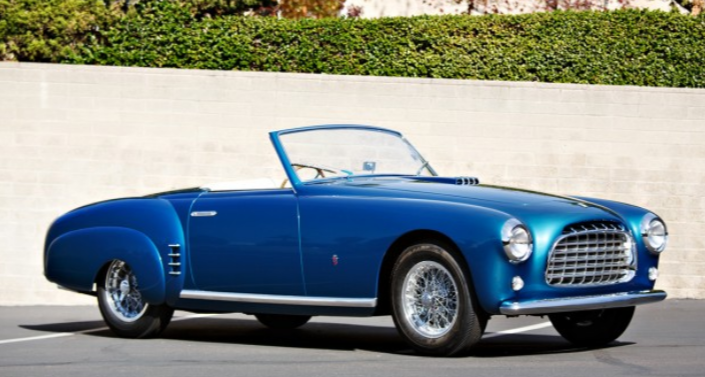 This entry was posted in Uncategorized and tagged 1952, 212 europa, 212 inter, auctions, cabriolet, cars, classic cars, ferrari, ghia, gooding & company by classiccarweekly. Bookmark the permalink.